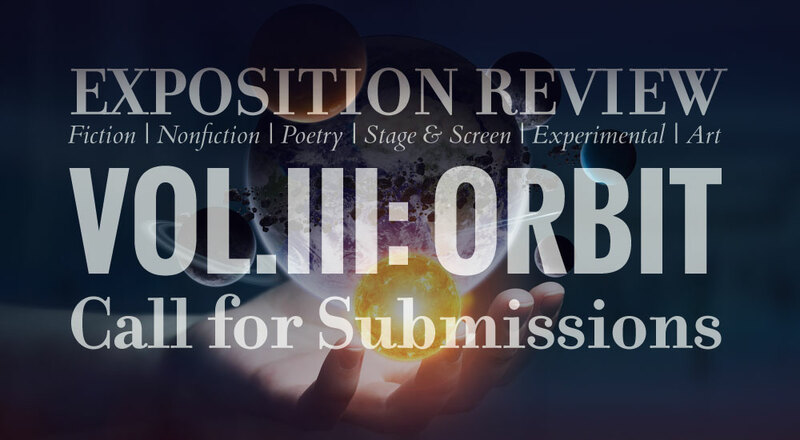 Exposition Review is excited to announce that we’ll be opening submissions for our 2018 issue this Friday, September 15! We accept fiction, nonfiction, poetry, and scripts for stage & screen, as well as visual art & comics. We also welcome experimental works and love hybrid forms! Submissions will be open through December 15, 2017. To be in orbit is to be in motion, set on a constant, circuitous course of action. It brings to mind celestial bodies and forces of nature, but we can see smaller orbits in our daily lives: the spheres we inhabit and the grooves we wear in the world around us. An orbit is the familiar: that which we seek to find and escape from. There’s also an inherent tension in the idea that our path can be dictated by the gravitational pull of an other, whether that’s a planet, a person, or even an idea. It’s a force that draws you in and also keeps you at arm’s length: two entities circling each other with no end in sight. And yet, an orbit holds the promise of being a part of something bigger than yourself, or of finding a new road to follow. There’s a sense of excitement and adventure—and that’s exactly what we want to see in your work. We’re looking for stories about the distances we travel, even when we’re standing still. We want to read about the relationships and revolutions of the world and the people in it. Ultimately, we want narratives that are fully realized, pulling us deep into the universe you’ve created with your words and art.